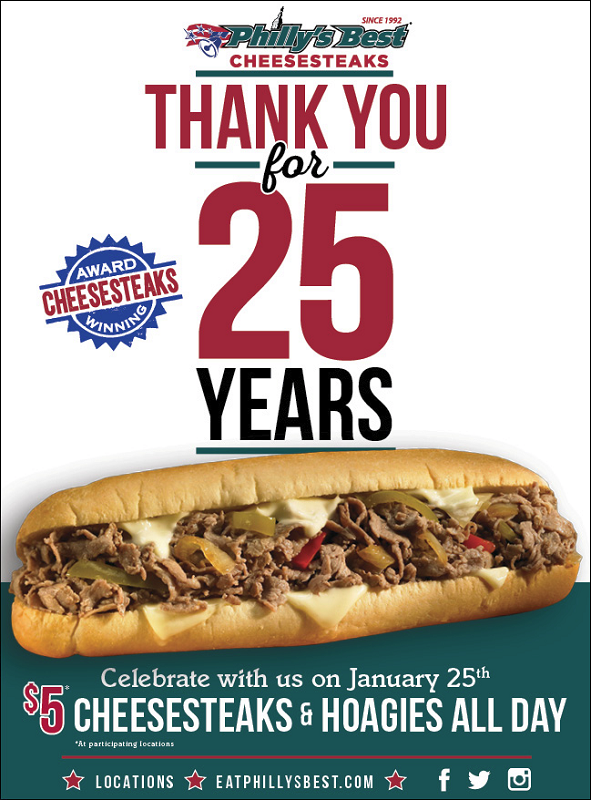 The Southern California sandwich shop — founded by former Philadelphians — is celebrating its 25th anniversary today (January 25). The Mira Loma Five Guys is open! Courtesy of this tweet, we learned that the Mira Loma Five Guys Burgers and Fries, at 6285 Pats Ranch Road, Suite A, opened today! As with the recently-opened Rancho Cucamonga location, the Mira Loma location will be open from 11 a.m. to 10 p.m. daily. Besides the Rancho Cucamonga location, the Mira Loma store joins the current I.E. locations in Temecula and La Quinta. Future Inland Empire locations include: San Bernardino, Redlands, Moreno Valley and Corona. Click here to read Andrew Edwards’ story on the chain’s expansion into the Inland Empire.